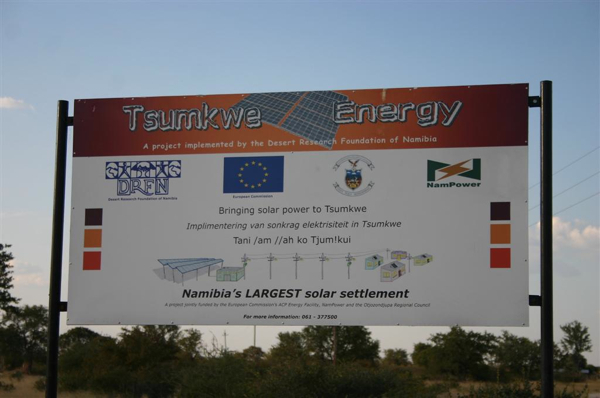 The Tsumkwe Energy project was implemented over a 4 year period, from 2008 by the Desert Research Foundation of Namibia (DRFN), NamPower and the Otjozondjupa Regional Council of Namibia (OTRC), with financial support from the European Commission Africa Caribbean and Pacific (ACP) EU Energy Facility. The settlement of Tsumkwe is situated in the Otjozondjupa Region of Namibia, about 300 km from the nearest electricity grid. At the onset of the project energy was provided only by diesel generators, between 12 and 14 hour per day. To improve the supply of electricity to the inhabitants, institutions and businesses of Tsumkwe, and decrease the cost of generating electricity, the Tsumkwe Energy Project introduced a solar diesel hybrid electricity system. To improve the efficiency of energy use, energy efficiency measures and appropriate thermal energy sources were introduced to the inhabitants in Tsumkwe. The improved access to electricity has created opportunities for social and economic development of the inhabitants of the settlement. The overall developmental objective of the Tsumkwe Energy Project was to contribute to the reduction of poverty in the Tsumkwe settlement by providing an enabling energy infrastructure that contributes to increased and diversified socio-economic activities. In January 2012 the Honourable Minister of Mines and Energy, Mr. Katali inaugurated the Tsumkwe Energy hybrid supply system consisting of a 202kWp solar PV-diesel hybrid mini-grid installation, along with substantial energy efficiency measures. The beneficiaries of the project include: the OTRC; the Tsumkwe settlement and community which consist of approximately 1000 permanent residents; several service providers, supporting the 2000 – 3000 San living in and around Tsumkwe; government policy makers; energy supply organisations, organisations active in the field of rural development; and engineering organisations specialising in rural energy supply.